September 20, 2018 – Days of rain following the onslaught of Typhoon Ompong did not deter the Municipal Action Team (MAT) of Aritao, Nueva Vizcaya from joining the Rapid Damage Assessment and Needs Analysis (RDANA) done by the local government unit to check for damaged houses and affected families in the municipality. The RDANA team had to traverse muddy areas and flooded zones to try to check for affected families from the typhoon. The team was able to identify 54 families composed of 215 individuals who had to leave their houses and temporarily take refuge in three evacuation centers situated throughout the town. Mr. Jestony Pineda, a Social Welfare Assistant (SWA) for Pantawid Pamilyang Pilipino Program stationed in Aritao said that while the task was difficult, they found delight in the fact that they were able to help people in their time of need. “We are happy to help and to serve the people. No one has made it through life without someone else’s help. I had helping hands growing up. This is my way of giving back,” Mr. Pineda said. The evacuees meanwhile are happy for the assistance they received and thankful that the storm had already passed. Simang Galvez, 49 and a mother of 9, said that she is thankful that the team made it to their place to evacuate them even though the road to their area was highly treacherous at that time. “Nagpapasalamat kami na pinuntahan kami at kinamusta. Kahit delikado yung daan, pinilit pa rin nilang kami ay puntahan,” Mrs. Galvez said. As of the moment, all the evacuated families have already gone back to their respective houses and all the necessary assistance have already been given to them. September 19, 2018 – The Field Office, headed by OIC-Regional Director Lucia S. Alan, has started doing field visits to the affected families in different evacuation centers throughout the province of Cagayan. The field visits are being done to assess the condition of evacuees and the evacuation centers where they stay. DSWD is mandated to ensure that evacuation centers are well equipped to cater to the immediate needs of evacuees. As part of this endeavor, OIC Alan yesterday visited the municipality of Amulung, Cagayan where 584 families composed of 2,069 individuals were affected by Typhoon Ompong. “We were able to preposition 300 family food packs here before the typhoon. We want to make sure that the evacuees received the assistance that the field office gave as well as to know their situation here,” OIC Alan said. Lola Dolores Fiesta, 81, an evacuee presently staying in an evacuation center in Amulung East Central School, said that she felt happy and important because she merited a visit from the field office. “Agyaman nak ti DSWD ti parabur nga indanun da dituy. Dakkel nga banag iti relief goods kadakami nga nadangran, (I am thankful for the assistance that DSWD gave. The relief goods given will really help us who were affected)” lola Dolores said. Tuguegarao City – President Rodrigo Duterte will be making a visit to the Provincial Capitol of Cagayan today, September 16, 2018, to assess the extent of damage done by Typhoon Ompong as well as to coordinate the efforts done by the Regional/Provincial Disaster Risk Reduction Management Council (R/PDRRMC) and the local government units (LGUs) in disaster response. The Commander-in-Chief will be assisted by Department of Social Welfare and Development (DSWD) Secretary Virginia Orogo as well as DSWD regional counterparts. DSWD Field Office 02 (DSWD FO2) OIC-Regional Director Lucia S. Alan earlier said that the office is working round-the-clock to assist affected families and individuals throughout Region 02. “We have already started assessing the extent of damage in the areas affected by Ompong and the evacuees have already been given family food packs and other additional assistance,” Ms. Alan added. As of the moment, there are already 744 barangays, 21,648 families, 79,924 individuals affected by the typhoon throughout the region. The Department of Social Welfare and Development Field Office 02 (DSWD FO2) has started conducting preparation activities for the imminent arrival of Typhoon Mangkhut later this week. The field office’s Disaster Response and Management Division (DRMD) already distributed 21,700 family food packs to the provinces of Cagayan, Isabela, Quirino and Nueva Vizcaya as preparation for the typhoon. The province of Batanes meanwhile has 432 prepositioned sacks of rice ready for distribution, 72 sacks of which are in the provincial office, while the 6 municipalities of the province has 60 prepositioned sacks of rice each. Mr. Rommel Gamiao of the DRMD led a team that went to Batanes today to conduct preliminary meetings with the Provincial Disaster Risk Reduction and Management Council (PDRRMC) as well as to check the condition of the province’s evacuation centers. The DSWD FO2 warehouse meanwhile has 5,000 available family food packs, 1,000 hygiene kits, 2,500 collapsible water carrier with purification water tablet and 1,000 sleeping kits ready for distribution in case Local Government Units need augmentation. Members of the Philippine Army also assisted in the stockpiling of family food packs in the field office. The Department of Social Welfare and Development Field Office 02 (DSWD-FO2) thru the National Household Targeting System for Poverty Reduction (NHTS-PR), popularly known as Listahanan, awarded the List of Poor Households in the Region to the Commission on Population Regional Office 02 (POPCOM RO2) on July 30, 2018. Pursuant to Executive Order No. 12 (E.O. No. 12), otherwise known as “Attaining and Sustaining Zero Unmet Need for Modern Family Planning”, POPCOM is mandated to undertake and coordinate demand generation activities on Responsible Parenthood and Family Planning (RPFP) to ensure that couples are able to meet their desired number of children by teaching them topics on responsible parenting, fertility awareness and different family planning methods. Thru Listahanan, the POPCOM will be able to identify who, where and how many have not yet undergone the RPFP class and identify from among them those with unmet needs so as to know those couples who need to be referred to trained health service providers for mentoring, referral and counseling on Modern Family Planning. Moreover, Listahanan would enable POPCOM to plan and forecast the necessary budgetary requirements for demand generation activities. 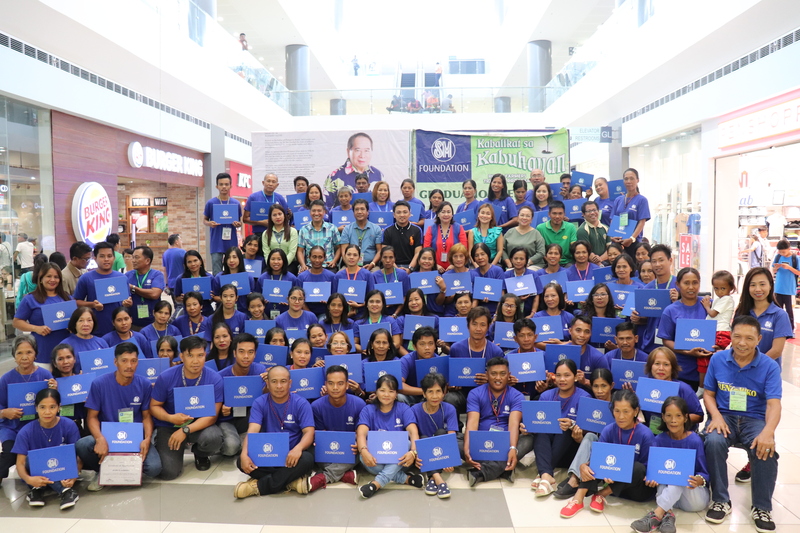 The Department of Social Welfare and Development (DSWD FO2) in partnership with the city government of Tuguegarao launched the 40th National Disability Prevention and Rehabilitation (NDPR) Week with the theme: Kakayahan at Kasanayan para sa Kabuhayan Tungo sa Kaunlaran with a host of activities to commemorate the celebration. The activity, celebrated from July 17-23, 2018, was launched with a motorcade from the Technical Education and Skills Development Authority (TESDA) Region 02 vicinity in Carig Norte, Tuguegarao City going to the People’s Gym, Centro, Tuguegarao City last July 17, 2018 which was led by the field office and joined by partner agencies. A program at the Tuguegarao City People’s Gym which was attended by about 300 Persons with Disabilities (PWDs) coming from Tuguegarao City and the nearby municipality of Iguig was done after the motorcade where select PWDs where given assistive devices such as wheelchairs and crutches. The Filanthropist Educators Foundation, Inc. also provided free school materials to the children participants of the event. Sheikha Luga, 5, one of the beneficiaries who were given a wheelchair, was so eager to use the device given to her that she used it immediately after receiving it from the field office. OIC-Regional Director Lucia S. Alan mentioned that it is the field office’s priority to implement programs and services targeting vulnerable sectors like the PWDs so they can be empowered to also succeed in life. “Hindi hadlang and inyong kapansanan para makamit ang tagumpay sa buhay,” OIC Alan said. An inauguration of a new Person with Disability Affairs Office (PDAO) in Santiago City, Isabela was also done in line with the NDPR celebration last July 19, 2018 along with the launching of a new Center for the Elderly for the senior citizens of the city. The DSWD Sustainable Livelihood Program (SLP) in partnership with SM Foundation, Harbest Agribusiness Corporation, SM Supermarket, SM Supermalls, Department of Agriculture (DA), and the Local Government Units of Aparri and Lal-lo led the SM Kabalikat sa Kabuhayan Rural Farmers Training Program harvest festival and conferment rites of the 91 SLP participants together with 86 other small budding farmers last July 9-12, 2018 held at the towns of Aparri and Lal-lo and SM Center Tuguegarao Downtown. The aforementioned activities were graced by the presence of SLP RPMO technical staff, SLP Provincial staff, SM Foundation Vice President Cristie Angeles, Harbest Agribusiness Corporation representative Mark June Ariola, Department of Agriculture representatives, SM Supermarket representatives, the Local Government Unit (LGU) of Aparri as represented by Sangguniang Bayan (SB) Member Ria Capina, the Local Government Unit (LGU) of Lal-lo as represented by Municipal Mayor Florante C. Pascual, Vice Mayor Florence Oliver B. Pascual, 1st District Board Member Maria Olivia B. Pascual, Barangay Officials, School Officials, the Municipal Action Team of Aparri and the Municipal Action Team of Lallo. The conferred graduates were part of the 169th and 170th batches in the country who successfully completed the 12 week training. They were provided with updated agricultural farm technology on high value crops and enhanced profitability through sustainability forum. Likewise, the endeavor reaped a bountiful harvest on both techno demo farm sites. High value crops such as honey dew, water melon, cucumber, bitter gourd, eggplant, chili, okra, sponge gourd, upland kangkong and string beans were harvested. On-site marketing of the produce was also conducted. Posted on 08 July 2018. In connection with the National Household Targeting System for Poverty Reduction (NHTS-PR) or Listahanan data sharing with different line agencies throughout the region, the Department of Social Welfare and Development Field Office 02 conducted a final inspection meeting with the Commission on Population Regional Office 02 (POPCOM RO2). The DSWD-FO2 inspection team headed by Matthias James Ryan L. Tangonan, Regional Information Technology Officer II (RITO II) of Listahanan, was done to check the compliance of POPCOM RO2 to the necessary physical and technical security measures for the sharing of the Listahanan Data. Consistent with Rule VI of the IRR of RA 10173 or the Data Privacy Law, data users and the Personal Information Controller (PIC) of the agency shall establish organizational, physical and technical security measures for data protection. POPCOM is the first National Government Agency (NGA) to undergo the inspection meeting for the Listahanan Data Sharing.